I love my Instant Pot, oh, yes, I do. Mom would say, “Why don’t you marry it, then?” Well, that’s just silly. Because I’m already married, that’s why! ANYWAY, I made bean soup in my beloved Instant Pot. Out of dried beans. And it took about two hours, start to finish. Ain’t that purty? I turned the Instant Pot onto Saute and heated some olive oil, then plopped in some celery, onion, and carrots. When that was tender, I added about 4 cups of water, vegetable bouillon to match, about two teaspoons of Penzeys Tsardust Memories spice, and a cup of dried beans. I’m posting today at Fatal Foodies about a soup that was much easier, but not nearly as good! A WRITING PROMPT FROM ME TO YOU: A character is asked a sarcastic question. OR: What’s the most sarcastic question you’ve ever been asked? This entry was posted in Food. Tagged soup, vegan. I love Penzeys Spices. I’ve never seen this particular one but when I’m in the store I’ll look for it. 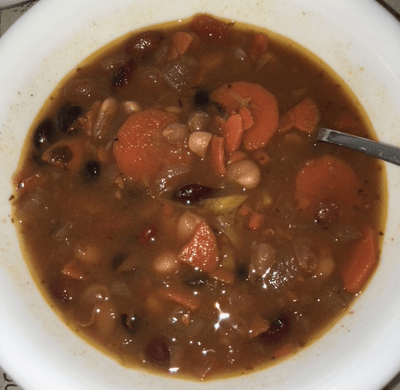 I made bean soup over the weekend but did it on the stovetop and used the Joy of Cooking bean soup recipe that they claim is like U.S. Senate bean soup. I like this soup, regardless of its political connection. #4 Daughter lives in walking distance of a Penzeys brick-and-mortar store! Some time when I visit her, we’re going on a field trip! You put the beans in dry? Mary always has trouble with dried beans: they come out crunchy, even in the Instant Pot. She usually soaks them overnight. I’ll have to tell her this. I put the beans in dry. My recipe said to turn the pot to Seal, and pressure cook for 60 minutes. Then I let it reduce pressure on its own, but the kidney beans were still crunchy-ish, so I pressure cooked for another 30 minutes and reduced the pressure manually ’cause we were HONGRY. Perfect. So, next time, I’ll just leave ’em in for 90 minutes, if there are kidney beans involved. I love my Instant Pot too. I made beef stew last week and am making chili this afternoon. I love that I stArt later in the day, and share in the same pot. I am using canned beans today,but need to try starting from dry. Yours looks warm and delicious to me. Spellchecker isn’t my favorite tool! Saute! I meant to say. Instant Pot equals slow cooker? Sorry, not familiar with US brand names. The Instant Pot is a fairly recent device that can be used as a slow cooker OR a pressure cooker OR a steamer OR a rice cooker. And you can saute in it, too, so it’s a pretty universal appliance. If I could only have one cooking appliance, I would choose this. Wow, I had no idea. I’m pretty sure we don’t have them here yet. I did buy a slow cooker a year ago. I think I tried it once or twice and gave up coz it was easier to just cook normally. The versatility of your device is a big positive though.